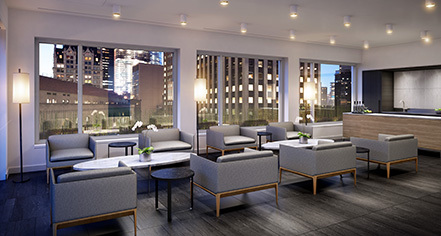 AKA Wall Street fills a need for business and leisure travelers seeking luxury furnished accommodations in the Financial District of lower Manhattan. Combining classic architecture with modern design and efficiency, the building showcases open spaces and an abundance of natural light. Specializing in daily, weekly, and monthly stays, AKA Wall Street features 132 spacious, sophisticated suites with outstanding residential amenities, designed around the needs of the extended stay traveler. Amenities include a 24-hour front desk, complimentary WiFi, Technogym fitness center, rooftop lounge, private cinema, business center, and conference room. Visitors to New York City’s Financial District can find delectable dining, world-class shopping, and some of the city’s tallest buildings, including One World Trade Center and 4 World Trade Center. It is also home to Wall Street, New York City’s powerful and leading financial center, and headquarters to the New York Stock Exchange and NASDAQ. 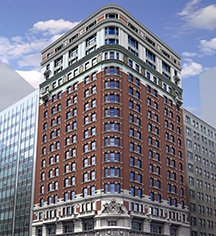 With its advantageous location, AKA Wall Street is within walking distance to many notable cultural attractions and experiences, including the 9/11 Memorial & Museum, Skyscraper Museum, Museum of Jewish Heritage, Museum of American Finance, National Museum of the American Indian, Fraunces Tavern Museum, and Federal Hall. AKA Wall Street, a member of Historic Hotels Worldwide since 2016, dates back to 1907. Through a screening partnership with the Tribeca Film Festival, AKA Wall Street will showcase programs and screenings throughout the year. Cancellation Policy: Cancellations must be made 72 hours prior to arrival to avoid a cancellation fee. Cribs and Pack-in-Plays: Pack-in-play is complimentary; crib fee is $50 per night. Early Check-In/Late Check-Out: Based on availability. Payment: All major credit cards are accepted. Learn more about the History of AKA Wall Street .